Mccallum, Margaret E.. "Sir Alexander Tilloch Galt". The Canadian Encyclopedia, 23 October 2015, Historica Canada. https://www.thecanadianencyclopedia.ca/en/article/sir-alexander-tilloch-galt. Accessed 23 April 2019. Sir Alexander Tilloch Galt, diplomat, politician, entrepreneur (born 6 September 1817 in London, England; died 19 September 1893 in Montréal, QC). Galt was one of the prime railway promoters of the 19th century and one of the first to call for a federal union of the British colonies (courtesy Library and Archives Canada/PA-13008). Sir Alexander Tilloch Galt began his working life in Canada with the British American Land Company in Lower Canada's Eastern Townships. Frustrated by the political deadlock in the united legislature of Canada East (Québec) and Canada West (Ontario), Galt first advocated annexation to the United States, but later worked for a federal union of the British North American colonies. After Confederation, Galt moved from electoral politics into diplomacy, while continuing to promote development in the Eastern Townships and later in southern Alberta. Alexander Tilloch Galt was the third son of John Galt and Elizabeth Tilloch. John Galt emigrated from Scotland to London, where Alexander was born. When John Galt travelled to British North America in the employ of the Canada Company, which he founded in 1824, he enrolled his sons at the new Anglican seminary in Chambly, Lower Canada. After being recalled to London in 1829 to account for his management of the company, Galt was imprisoned there for failing to pay his sons’ school fees. A successful writer of history and fiction, he turned to writing to pay his debts and recovered sufficiently to help found the British American Land Company in the early 1830s. In 1835, Alexander Galt emigrated to Sherbrooke in the Eastern Townships to work as a bookkeeper for the British American Land Company. 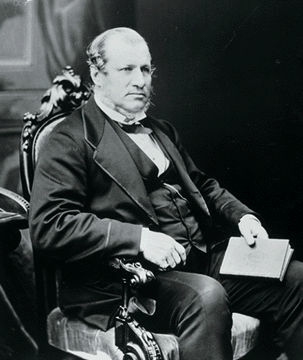 He spent part of 1842–43 managing the company’s office in London, England, and on his return to Sherbrooke, soon became the company’s Canadian head. Galt invested the company’s profits in developing Sherbrooke as an industrial centre and promoting railways to link the Eastern Townships to Montréal and the American seaboard. A founder of the St. Lawrence and Atlantic Railroad, he became its president in 1849. He was also a partner in the railway construction firm of C.S. Gzowski and Company, which built sections of the Grand Trunk Railway. Galt married into the prominent Montréal merchant family of John Torrance in 1848. His wife, Elliott Torrance, died the following year after giving birth to a son, Elliott. Galt then married his sister-in-law, Amy Gordon Torrance, and the couple had two sons and eight daughters. Galt entered politics in 1849 as the representative for Sherbrooke, obtaining a seat in the legislature by acclamation on the death of the incumbent. Galt defined himself as politically independent. He supported Montréal merchants in their demand for annexation to the United States, to the consternation of some of the officers of the British American Land Company in London. When the capital of the Province of Canada moved to Toronto in 1850, Galt resigned his seat. He re-entered politics in a by-election in 1853 and remained in office until 1872. Galt’s support for pro-development policies aligned him with Reform or Rouge parliamentarians on such issues as the abolition of seigneurial tenure. But efforts to obtain government subsidies for business ventures, particularly railroads, brought him closer to the Conservatives. In 1858, Galt accepted the position of finance minister in the government formed by John A. Macdonald and George-Étienne Cartier (see Double Shuffle). As a member of the government, Alexander Tilloch Galt pressed for a federal union of the British North American colonies that would end the awkward political structure of the day and allow Ontario and Québec to regain their separate legislatures (see Provincial Government). In 1864, the government fell in the controversy over Galt’s earlier decision, as minister of finance, to advance $100,000 to the Grand Trunk Railway. Galt endured and helped form a coalition government led by John A. Macdonald and George Brown to push forward with the federal union plan. Galt attended the Québec Conference in 1864 and was part of the Canadian delegations sent to England in 1865 and 1866 to negotiate the final terms of the British North America Act, 1867. After Confederation, Galt joined the first federal Cabinet as minister of finance but resigned before year’s end when the government rejected his recommendation to provide $500,000 in financial assistance to a struggling bank, which then failed. Unable to support either the Conservatives or the Liberals led by Alexander Mackenzie, Galt retired from Parliament in 1872. In 1871, Britain and Canada concluded the Treaty of Washington, which dealt with a number of outstanding sources of irritation, including American access to Canadian and Newfoundland inshore fisheries (see History of Commercial Fisheries). British authorities chose Alexander Tilloch Galt as Canada’s representative on an arbitration commission established under the Treaty to determine what compensation the American government would pay for the privilege of access. Sir John A. Macdonald appointed Galt as Canada’s first high commissioner in London, where he served from 1880 to 1883, promoting Canada as a land of opportunity for investors and emigrants. While in London, Galt raised capital to develop coal resources in what is now southern Alberta, working with his son Elliott, who had been serving as assistant commissioner of Aboriginal affairs in the area. Aided by a federal land grant of one million acres, the Galts built transportation infrastructure and large-scale irrigation projects in the area around Lethbridge, which was named in honour of one of the British investors. Galt died in Montréal in 1893. Sir Alexander Tilloch Galt began his career as an entrepreneur and politician in a country in need of immigrants and capital, where people who risked other people’s money could fail miserably or could achieve great things for themselves and for their communities. Galt did the latter. A far-seeing and flexible thinker, he adjusted his political views and his entrepreneurial focus to take advantage of changing circumstances. As an advocate of federal union, Galt played a significant role in devising the financial arrangements that persuaded Nova Scotia and New Brunswick to join what became the Dominion of Canada. Both before and after Confederation, Galt’s support for immigration, state subsidies for railway construction, and high protective tariffs advanced his business interests and the interests of a developing colony. See also Fathers of Confederation. SIR ALEXANDER TILLOCH GALTA profile of Sir Alexander Tilloch Galt. From Library and Archives Canada. SIR ALEXANDER TILLOCH GALTA biography of Sir Alexander Tilloch Galt. From Dictionary of Canadian Biography.